The election was a monumental moment in Irish history. IT WAS A hundred years ago on Friday that Irish citizens went to the polls in the historic 1918 General Election. The election was a monumental moment in Irish history. Hundreds of thousands of Irish men and women cast votes for the first time. On the back of that wave, the radical Sinn Féin swept to power, almost completely wiping out John Dillon’s more moderate Irish Parliamentary Party (IPP), which had ruled the Irish political landscape for years. Ireland was still part of the United Kingdom at that point, Éamon de Valera’s Sinn Féin refused to take their seats in Westminster, instead setting up a parliament in Dublin and declaring Ireland an independent Republic. Meanwhile, in the north of the country, Edward Carson’s unionists took the most seats, reflecting the Protestant majority there. The events of the election would set Ireland on a collision course with England, which refused to recognise Ireland’s claim. This would lead to the Irish taking up arms in the War of Independence. To commemorate the centenary of the election, RTÉ will air a programme on Friday at 7pm. Election 18 will be a reimagining of the events of the 1918 election, with coverage mirroring that of a contemporary election count. The idea is to present it as though television existed at the time – with presenters in a studio reporting on the counts, cuts to count centres in different constituencies, and interviews with key political figures from the day. RTÉ’s David McCullagh and TheJournal.ie‘s Sinead O’Carroll will present the action from the main studio, cutting to interviews, analysis and mini documentary-style clips to give context. There will be interviews with key figures and analysis given from studio as the shocking results are announced in real-time. 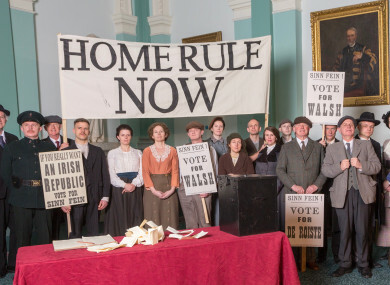 The show is a Loosehorse production, and will be directed by Ruan Magan, the man behind the IFTA winning documentary 1916- The Irish Rebellion. Loosehorse has form in this type of historical programming. It was behind the Trial of the Century programme, which saw Irish revolutionary Patrick Pearse in the dock defending his actions in an imagined trial. Programme producer Cormac Hargaden spoke to TheJournal.ie ahead of the programme airing on Friday. He said that in terms of Irish history, the election was massively significant, but received relatively little attention when compared with the events that came before and after. “In the space of 24 hours Ireland went from being part of the United Kingdom to an independent state. I thought it in many ways it was the forgotten story of the Irish revolution was 1918 General Election,” he said. Despite its significance, the election took place after the 1916 Rising and before the War of Independence – two periods upheaval and violence. “It probably got a bit crowded out then by the blockbuster events of the Rising and the War of Independence,” said Hargaden. The well-behaved child often doesn’t get as much attention as the screaming child in the corner. Hargaden hopes to bring the election alive for viewers, hoping that the unique way in which its presented will capture people’s imagination. “I’d like to think that it’s quite and entertaining watch and that by transporting it into a real time world I hope that we would be able to capture audiences that wouldn’t necessarily watch a more traditional dry documentary that might be on at 10pm at night,” he said. That would be nice if people came to it unexpectedly and stuck around… that they enjoyed the hour and a half of television and learned something too. That would be good. A lot or work has gone into the production, and Hargaden is hoping that it will resonate with viewers. But, as with all shows, it will undoubtedly have naysayers or traditionalists taking issue with what he terms the “elasticity” of the telling. “I think if you’re trying to please all of the people all of the time you wouldn’t be working in television,” he said. So I’ve no doubt that some traditionalists might have a difficulty with the elasticity of our creatives. “But at the same time there is I think form a historical accuracy point of view underneath what is quite a high concept project we’ve got really robust historical accuracy. I’d rather be making something and taking a bit of a creative risk to try and find a new audience rather than just phoning it in. Election 18 will air Friday at 7pm on RTÉ One. Email “100 years ago this week, Sinn Féin swept to power in the historic 1918 General Election”. Feedback on “100 years ago this week, Sinn Féin swept to power in the historic 1918 General Election”.